We are producing video tutorials to go with our upcoming Beachscapes Recipe Book release in a few months' time. 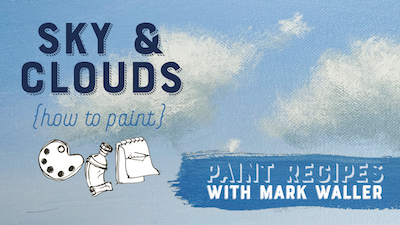 We hope you enjoy our first tutorial on Sky & Clouds, exclusively for you, right here! 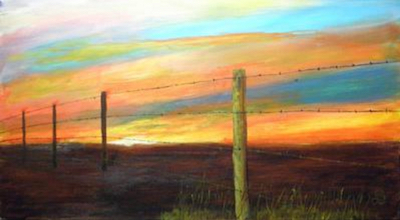 Approach your painting as if you’re on a construction site. Get all the big stuff, heavy lifting, framework, blocking in etc done first. Get colour down first, isolate your darks and lights etc. Then start adding your detail on top. You don’t paint the architraves if you haven’t put up the walls yet! As Frankie is actually going to Hollywood for a while, we didn't think it would be wise to leave Mark in charge of the instrument panel here at Explore HQ. Emails will be checked every few days, but please have your patient pants on until mid-May. Frankie hasn't had a holiday for 3 years! More On Water - New DVD Coming Soon! Mark's newest DVD will be coming in June 2017. To register for your exclusive pre-sale digital copy, and to see what it's all about, click on the link below. Follow us for regular inspiring posts, and other things I can find that I think you might enjoy. Yay for social media! Yay in general! Read more about Larry Baker's "The Fence That Changed The West"
No one can deny Jack Storms has a healthy self-confidence. However, taking 9 minutes out of your day to immerse in his masterful artistic process will be an experience you will remember forever. Absolute. Sheer. Beauty. Glass art to drool over. And this great 2-point perspective hack from Reza Asgaripour, architectural drawer. Struggling getting the bones of an architectural piece down? No problem! Click here for this great perspective tip. 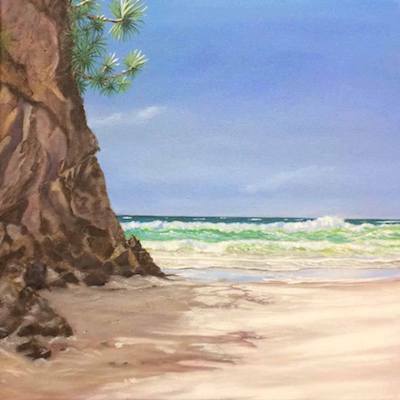 "South Gorge – North Stradbroke Island"
Straddie is my special place, and takes centre stage in many of my paintings. South Gorge is particularly lovely – this day I observed and photographed it at low tide – loving the striking rock formations, the long stretch of sand leading down to the water’s edge, warm autumn light filtering onto the beach – just perfect! 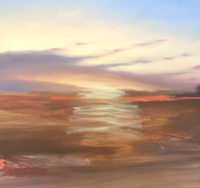 I initially underpainted the whole canvas a soft red, to create the sense of warmth I felt on that day – hoping it would create a glow which would show through the finished painting. I then chalked in the main features in the landscape, tinkering with positioning of the elements until I was happy with the results. I then commenced to block in loosely with Atelier Free Flow, setting down my base colours. A layer of glazing liquid went over the top, in readiness for the next stage. I then concentrated on the finer details – gradually adding layers of paint (Atelier Interactive) as I set about refining the colours of the sky and horizon, the ocean, waves and shoreline, gradually moving forward, attempting to create perspective and depth – using the glazing liquid to create translucence between the layers – I really love that stuff! 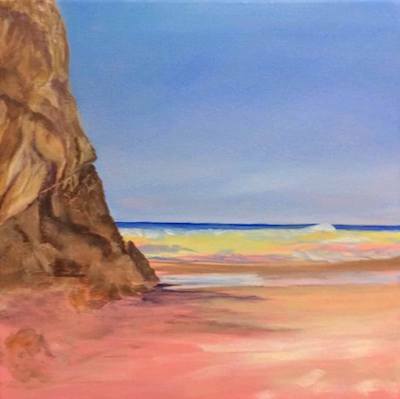 The rock formation was a bit of challenge; being in shadow it was quite dark in real life – so was at risk of taking over the whole painting. 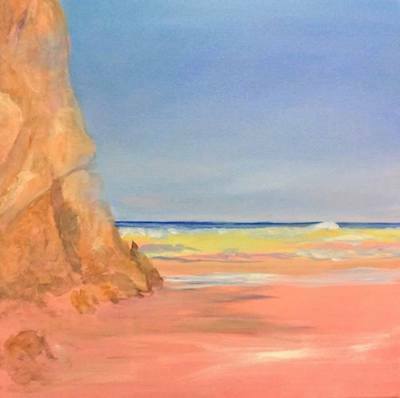 I have taken some artistic license and softened the colours to prevent it from popping out too much – I wanted the eye to be drawn down to the beach. 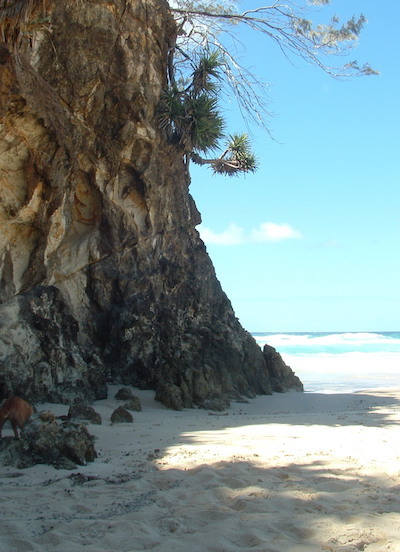 I then worked on the pandanus plants which cling precariously on the rock face of the Gorge – the leaves were partially in sunlight so I backlit and highlighted them where the sun touched the edges. 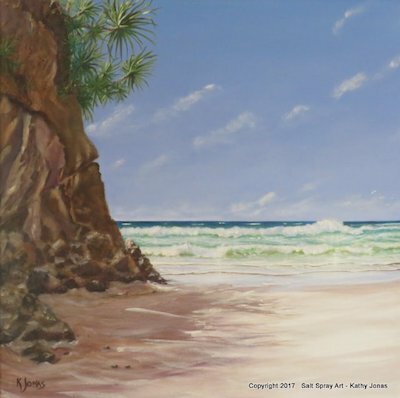 I left the painting in view for a couple of days so I passed it regularly as I went about my life – this way I tend to ‘see with fresh eyes’ areas that might need some tinkering with. Then the day arrived when I decided it was finished – and South Gorge was signed off, sealed and sent off to the Gallery!